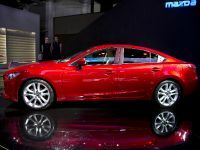 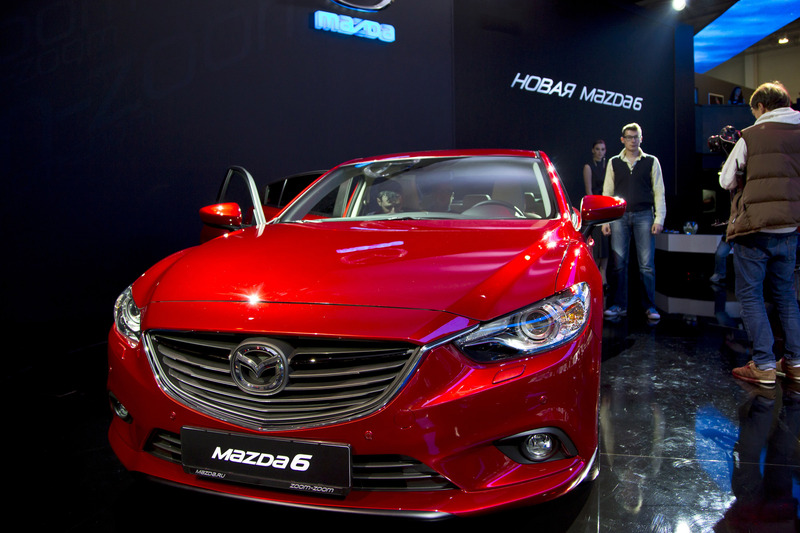 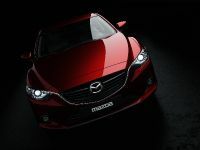 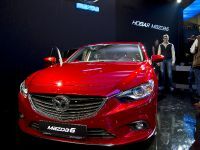 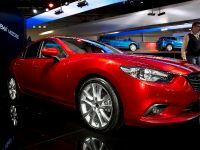 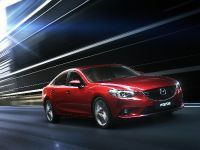 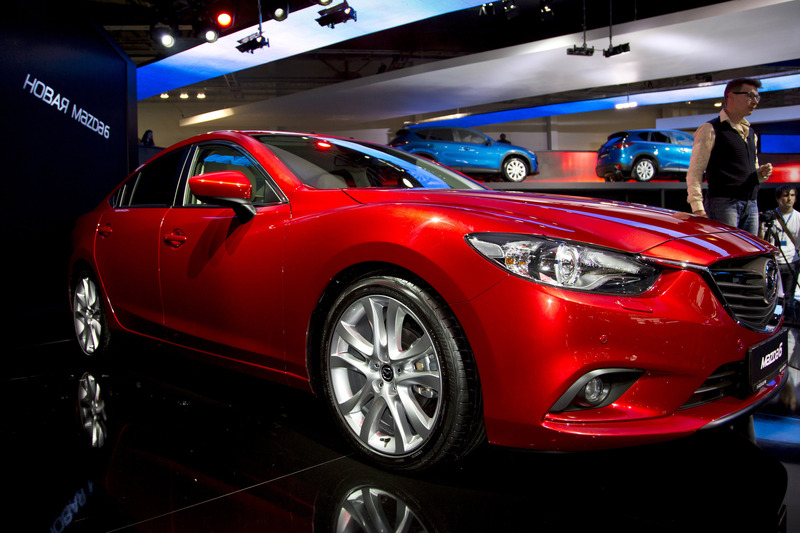 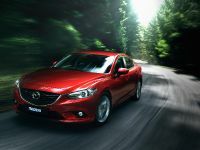 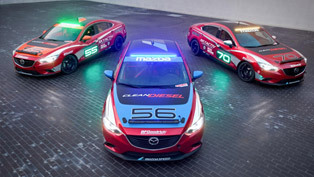 2014 Mazda6 Saloon celebrates its first world appearance 2012 Moscow Motor Show. 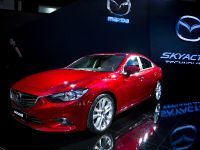 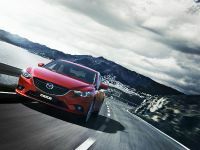 This is the second of the new generation of Mazda vehicles which are popular with the fact that they now include company's full range of SKYACTIV technology and the "KODO – Soul of Motion" design language. 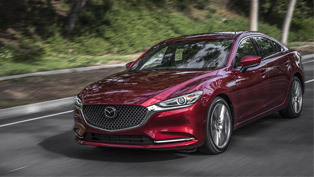 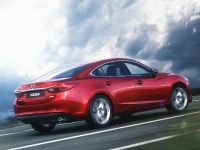 Moreover, the new Mazda6 flagship model will offer its customers high-quality driving experience and excellent outstanding safety an environmental performance. 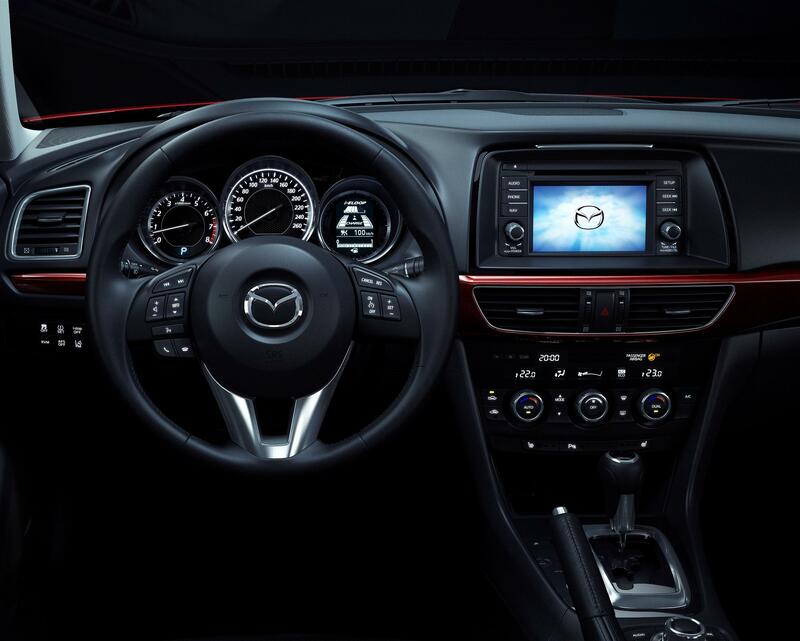 The latter technology features enhancements which contribute to improved fuel economy. 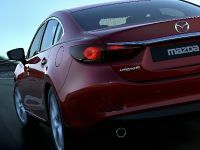 The first such device include is the i-stop idling stop system. 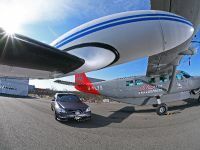 The next one - the i-ELOOP brake energy regeneration system. 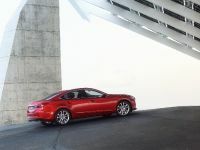 It begins charging a capacitor the moment the driver takes his foot off the accelerator. 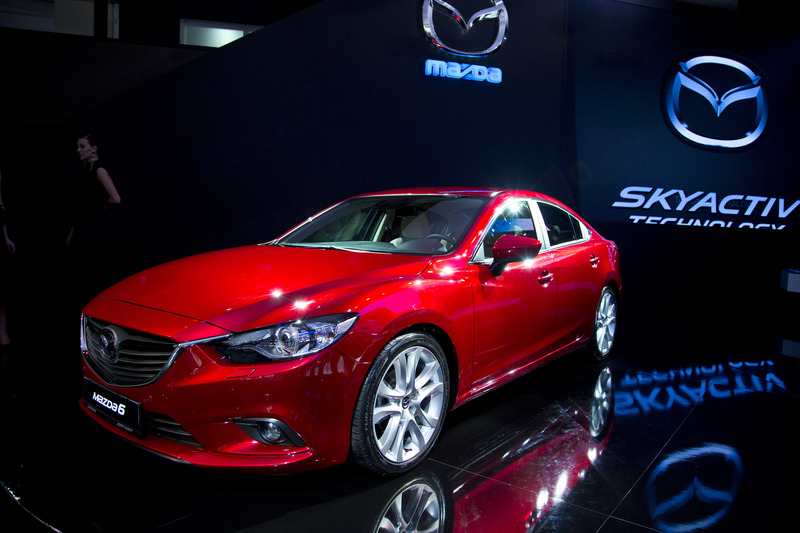 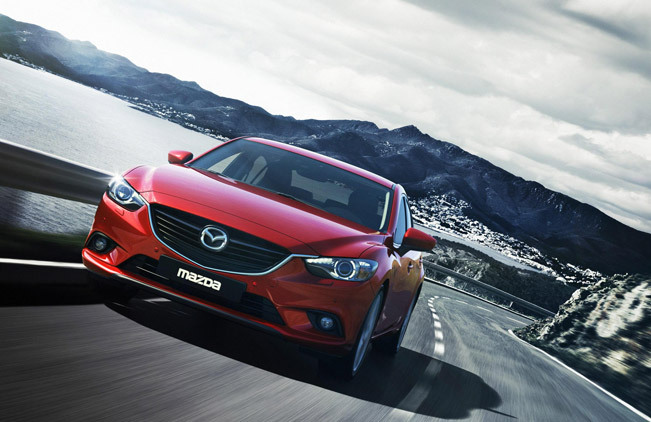 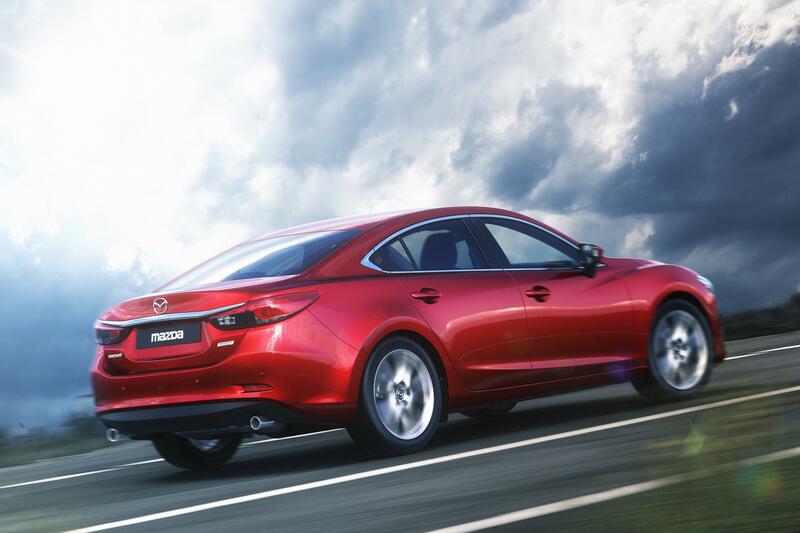 Both SKYACTIV technology and KODO design carry the new Mazda6 to a new level. 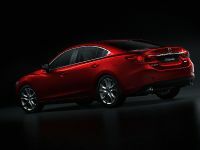 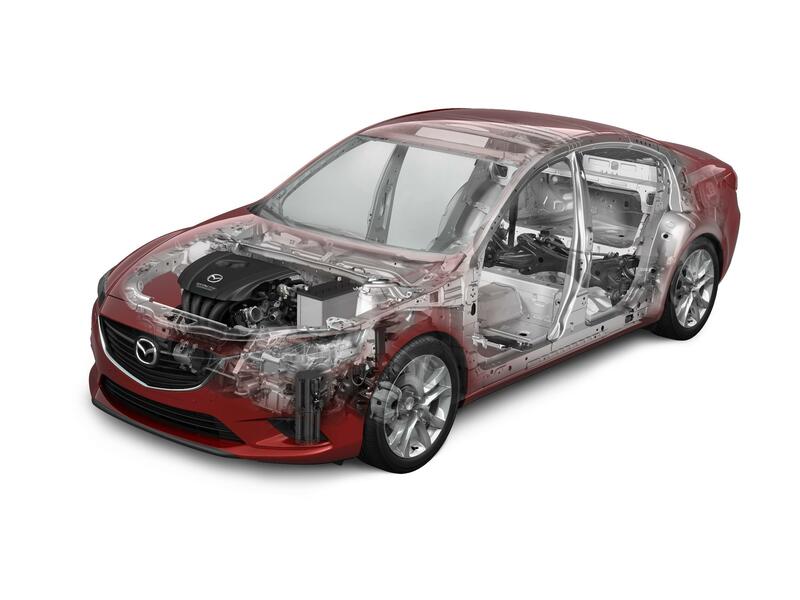 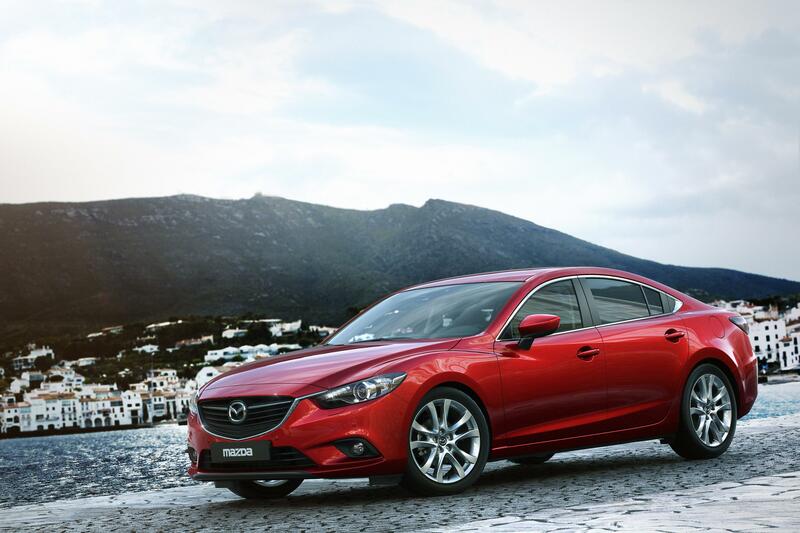 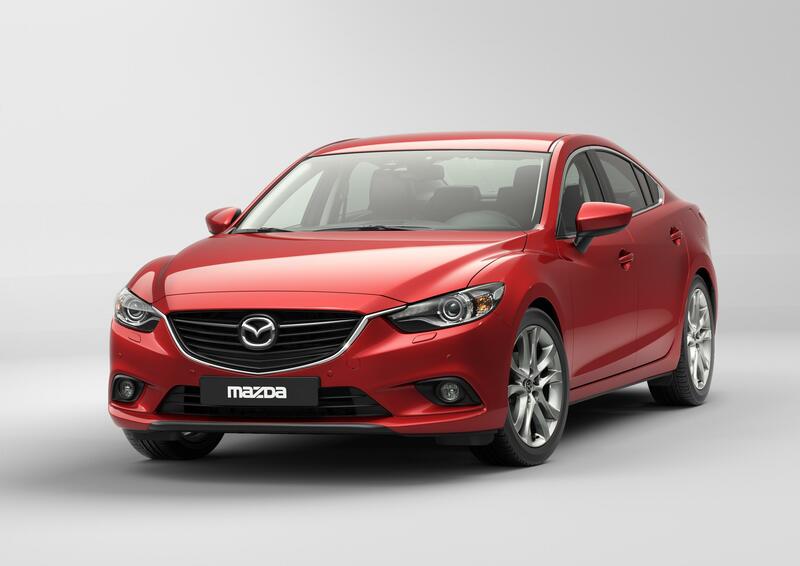 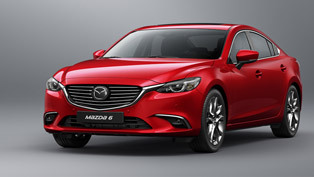 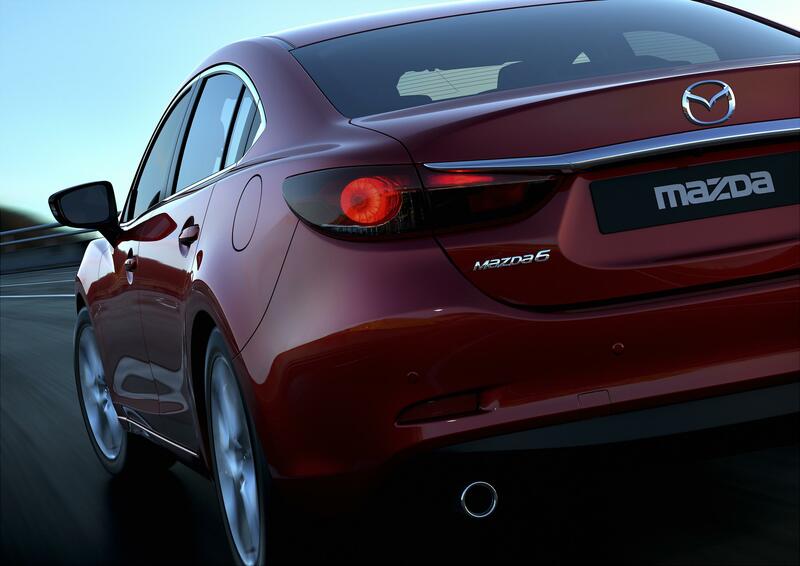 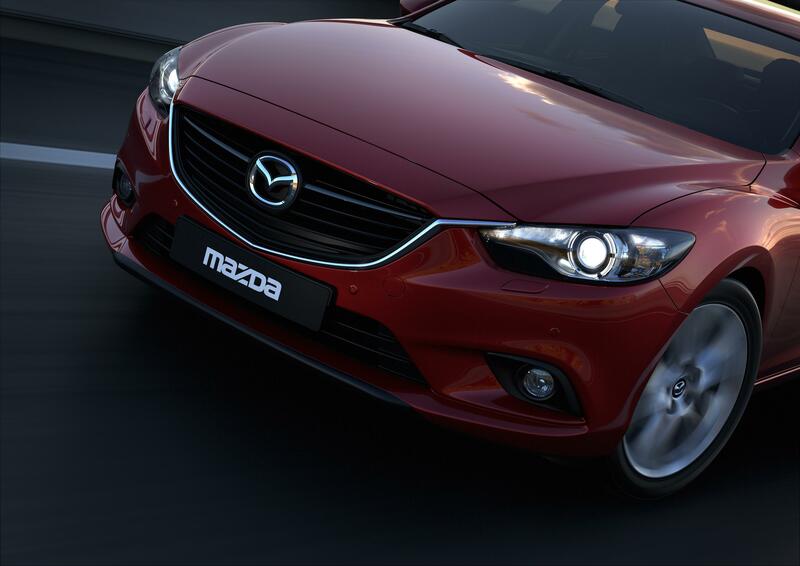 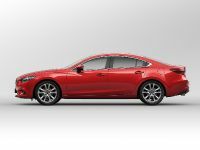 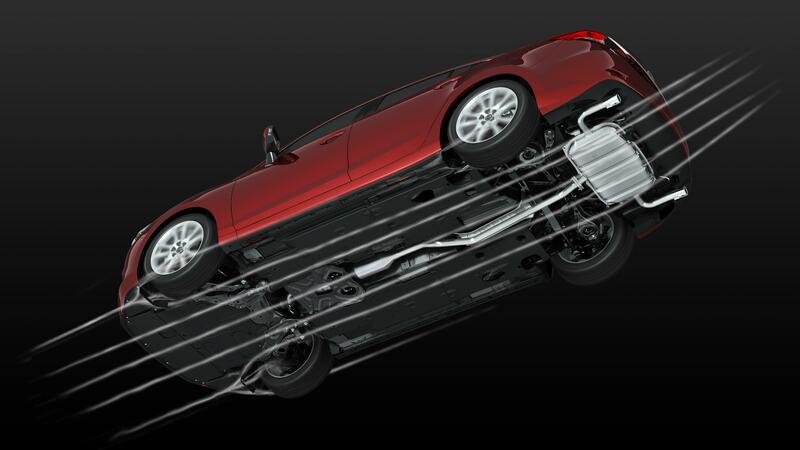 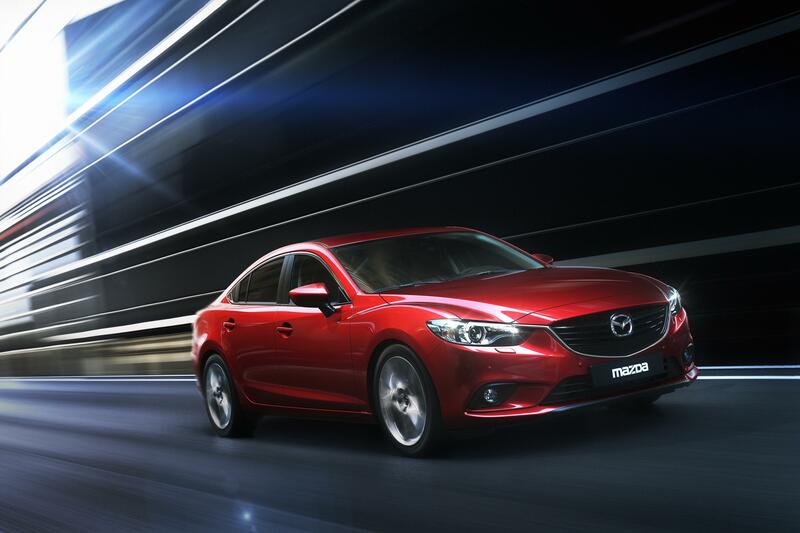 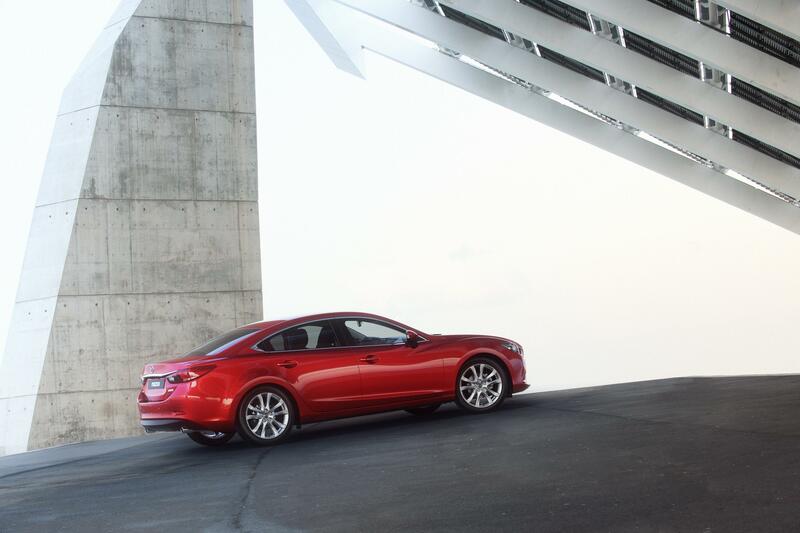 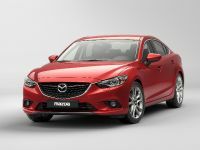 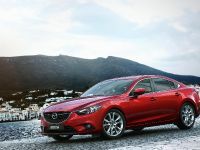 Mazda6 now has a robust framework and a low, wide stance that conveys strength and stability. 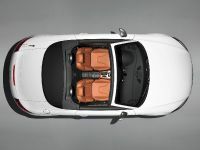 In addition it creates the impression of vitality and delivers feeling of luxury and quality. 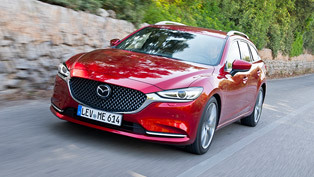 At first sight it is obvious that the new Mazda model has a deeply sculpted face. 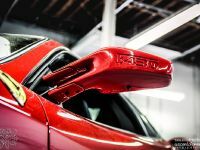 The hood creases extend from the tips of the signature wing and flow into the body character lines. 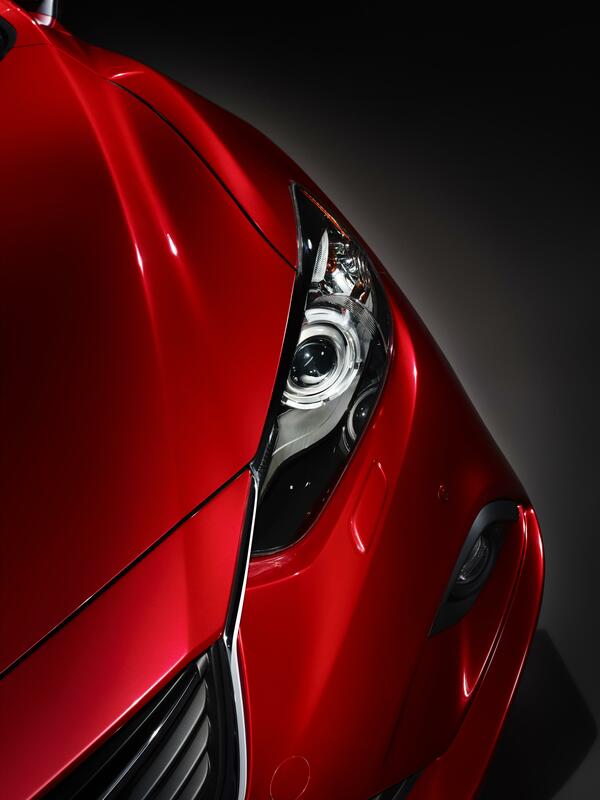 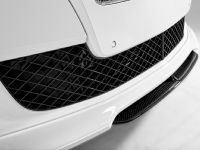 Adding the solid design of the nose, the overall dynamic form of the body expresses a strong desire for motion. 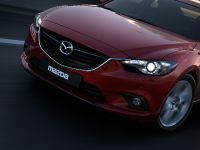 For the first time here are being used signature LED luminescence and halo ring light guides for the head lights. 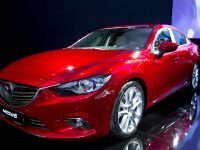 Another debut makes the utilization of the "Soul Red" paint. 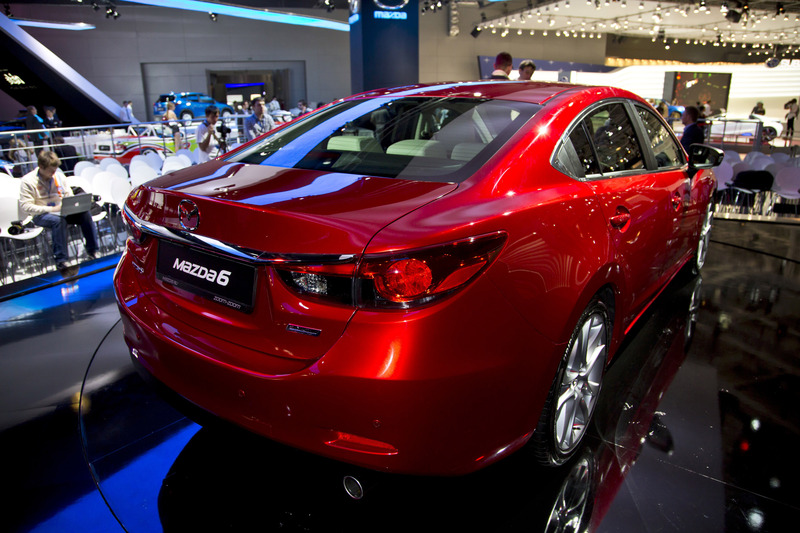 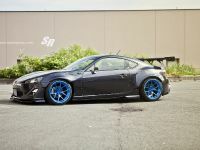 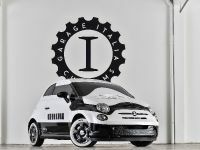 This is a new color, which was born of a unique technological process. 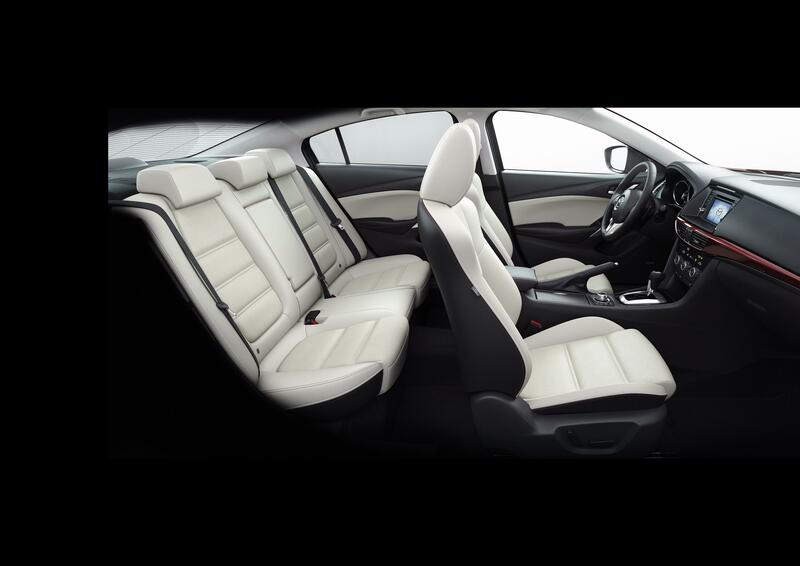 The interior of the car continues the luxury feel it conveys. 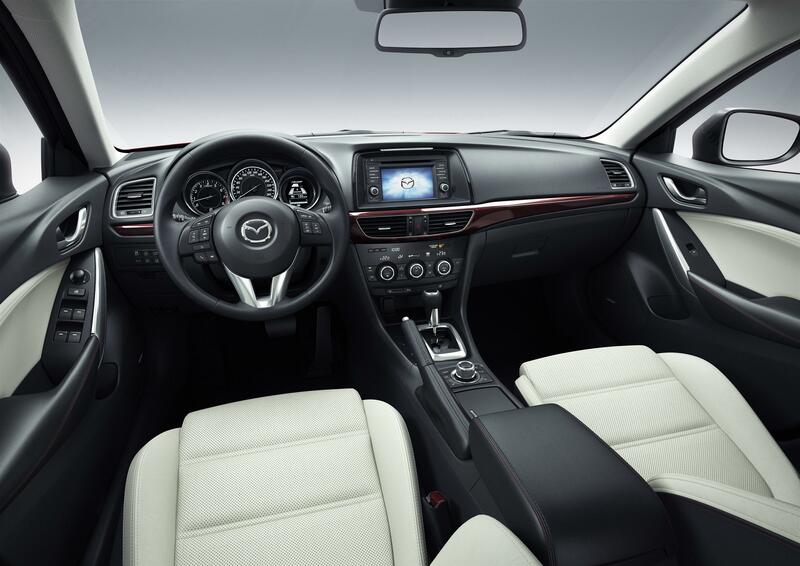 The driver-oriented cockpit delivers generous space. 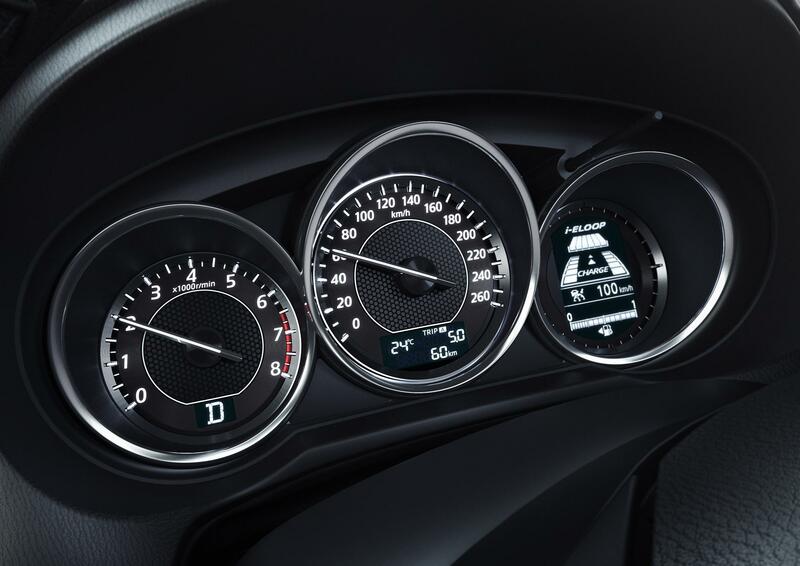 Three instruments are laid out symmetrically beneath the meter hood and heighten the expectation for exciting driving. 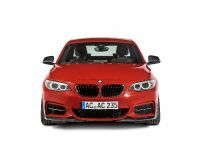 In details, the decorative centre stack panel includes two colors, namely the "Bordeaux metal" and the "Dark metal". 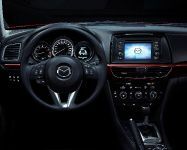 In the cabin, the dashboard and centre stack are laid out horizontally, and a smooth continuity between the upper area of the dashboard and the door trims creates an impression of simplicity and neatness. 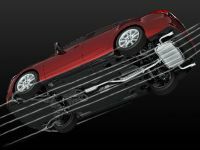 The 2,830mm long wheelbase is 105mm longer than previous model. 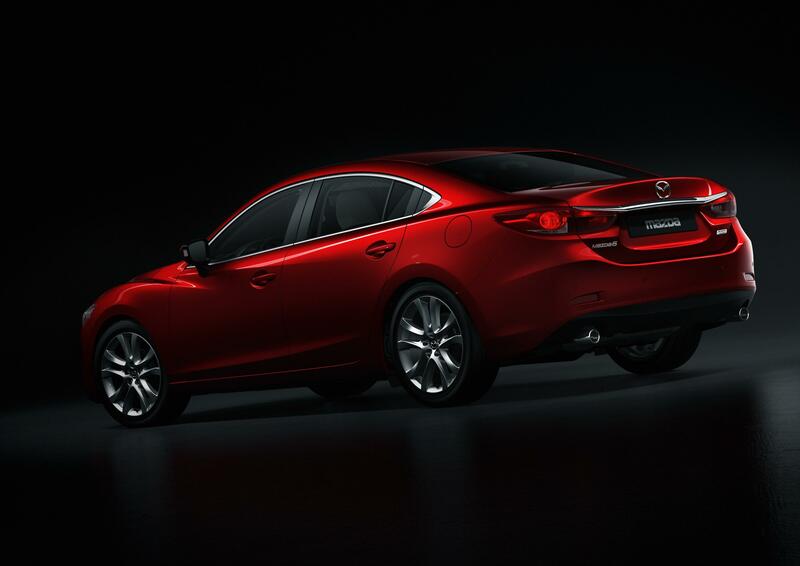 This means that the new Mazda6 now will offer more spaciousness for both front and rear space. 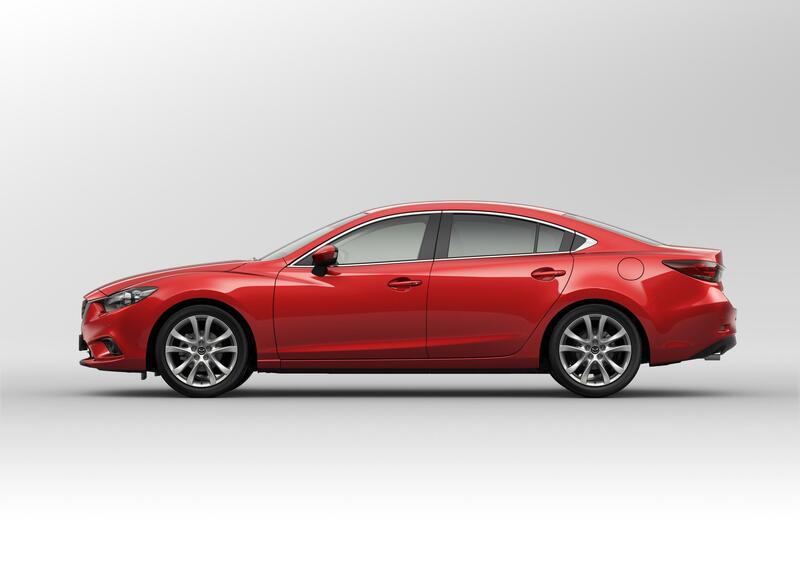 In addition, the large 19-inch diameter wheels create a feeling of unshakable stability. 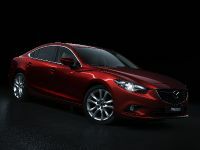 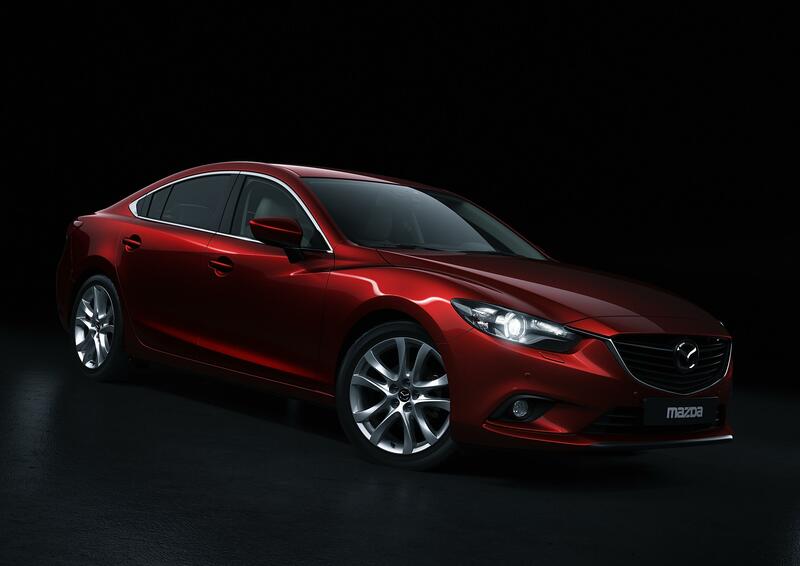 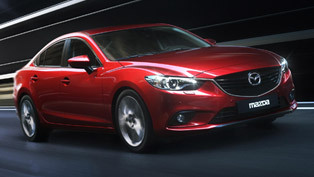 The new saloon has a finely tuned SKYACTIV-Chassis front MacPherson strut and rear multi-link suspension. 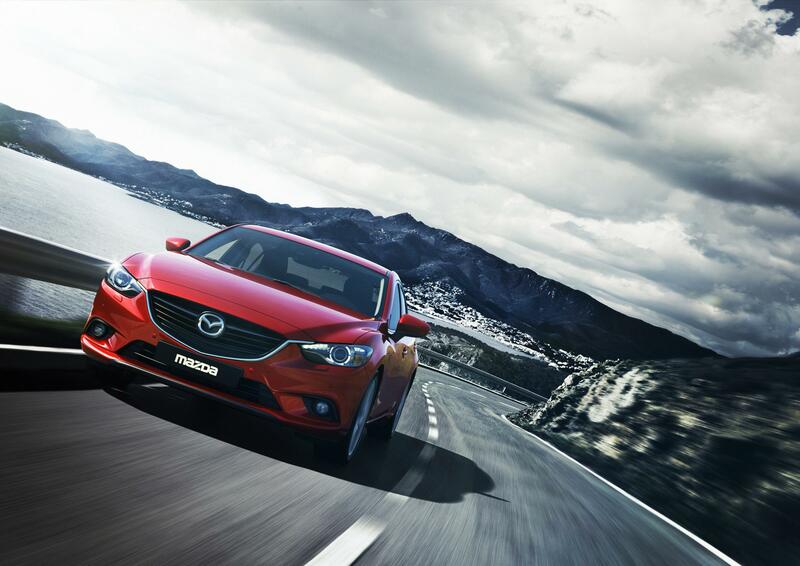 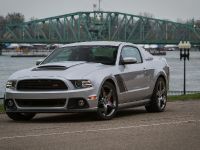 This offers agile handling in the low-speed to mid-speed ranges and outstanding stability in high-speed driving. The SKYACTIV-G 2.0 engine offers now an abundant torque at low engine speeds. 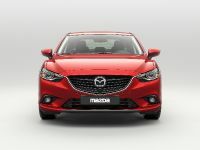 This contributes to a enjoyable ride and excellent fuel economy. The maximum torque is 210 Nm / 4,000rpm and maximum output is 150 hp (110 kW) at 6,000rpm. 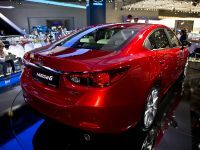 When equipped with the new SKYACTIV-G 2.5 the Mazda will offer maximum torque of 256 Nm / 3,250rpm, with 192 hp (141 kW) at 5,700rpm. 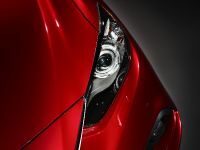 In addition, an array of advanced safety technologies has been: Rear Vehicle Monitoring (RVM) and Adaptive Front Lighting (AFS), Smart City Brake Support (SCBS), High-Beam Control system (HBC), Hill Launch Assist (HLA), Emergency Stop Signal (ESS), an Lane Departure Warning System (LDWS). 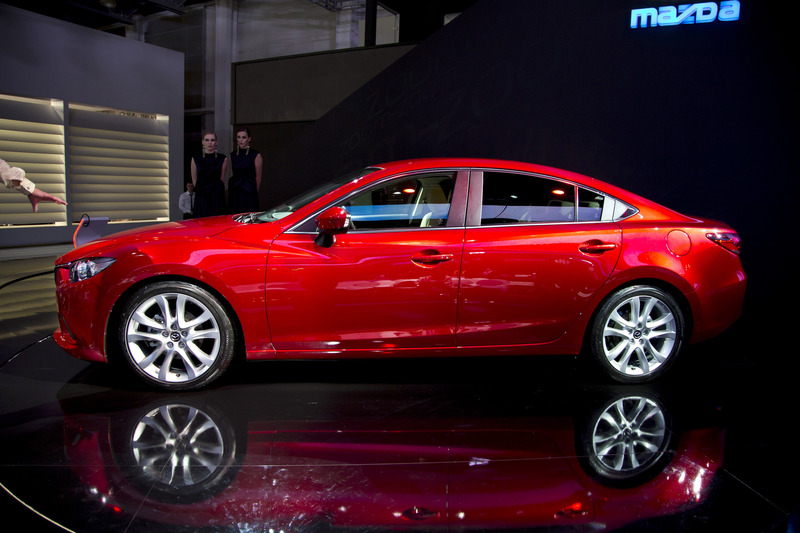 The new Mazda6 will be introduced to world markets in the end of the year.